Broadway Comes to Ambergris Caye! One thing never changes Â thereÂs always music to be heard around San Pedro Town. Better yet, itÂs most often FREE! But Broadway music Â performed on Ambergris Caye? I must admit, it seems oddly out of place on our laid back, Âno shirt, no shoes, no problemÂ Caribbean island. But that all changed on Friday, March 26, 2011, when a well known Broadway star and two other notable performers sang center stage at Ambergris CayeÂs Paradise Theater. For only $17 a ticket, my husband and I enjoyed three hours of first rate Broadway-style musical entertainment. Wandering around the lobby before the performance, and during the break, it felt like we were in an American theater. The difference, though, was that rather than sitting in the nose bleed section and paying $100+ dollars for a ticket, we paid $17 each to sit in the third row. There were other notable differences. Being Belize, there were no assigned seats. The Âfirst come, first serveÂ approach worked out well for us. And, of course, we were encouraged to bring our alcoholic beverages and food back into the theater, after the break. But on March 26 the Paradise Theater was the perfect venue for an authentic Broadway style performance! Appreciative expats and San Pedranos flocked to the impressive new theater. We were all anxious to hear Broadway star, Sean McDermott, perform live. But none of us realized we would be treated to an impressive mix of Broadway musical, operatic, classic rock and roll, and country Western tunes. Sean has been the star of musicals such as Miss Saigon, Chicago, and Grease. He even had a guest cameo in the popular Sunday night soap, ÂDesperate HousewivesÂ! He was joined by two other talented singers, James Anest (who performed an amazing operative piece), and Kara Shaw (a country western performer). Learn more about Sean McDermott by clicking here. Remember, I did move to San Pedro from the San Francisco Bay Area. I just accepted that I would have to give up this type of classical performance when I moved here. So how did this Broadway star come to perform on Ambergris Caye? 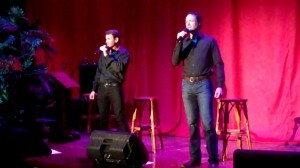 After all, Sean was one of four Broadway singers hand-picked by Barbara Streisand to replace ÂIl DivoÂ. He sang, at her side, on her 2007 European tour. HeÂs recognized as one of BroadwayÂs leading performers, having starred as Chris in Miss Saigon, Billy Flynn in Chicago, and with title roles in Jekyll and Hyde, Jesus Christ Superstar, Grease, Carousel, and Showboat. Sean is the son of one of San PedroÂs well recognized American expat businessmen, Corey McDermott. 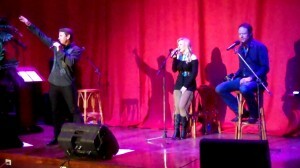 The concert was a benefit for a very good cause, Mama VilmaÂs Family Home. This new non-profit is committed to opening a home for abused women and children. The Mama Vilma Family Home will provide a safe haven, as well as food, clothing, counseling, shelter, medical services and education for children, in particular. For more information, and local articles about the performance check out this San Pedro Sun article.